Leora and Abe, both in their sixties, married for ten years, never know what to make for dinner. Both are fifty pounds overweight, yet both insist that they “hardly eat anything”. Each night, when they both come home from work, they stare at each other, in what sounds like an agonizing way, and after a few tense words they both grudgingly “put something together.” Leora would be happy with a bologna sandwich, but she knows that Abe would be grumpy if she did that. Abe wants a nice meal, but he says he is “too tired to think about it.” I wondered aloud, “what about making a book every week which says what you are having for dinner on each night? Then, you can make a shopping list accordingly.” Abe looks at me like I have made an absurd suggestion and he says “well, we have recipe books.” “No, I mean something more specific-a book which says Tuesday, November 2, 2010, lemon chicken, brocoli and roasted potatoes,” I say, knowing that this is not a brilliant idea, but I am curious to see how Leora and Abe will respond to the directive. To my surprise, Abe says “but I don’t want to do that, I want Leora to know what will make me happy.” I pause, pondering Abe’s remarkable comment. Then, I say to Abe “you and Leora are very different people and as such you have very different ideas about food and it is hard to come to terms with the idea that Leora does not mirror you in this way.” Abe looks at me with pain in his eyes. “I have a hard time accepting that,” he says, as if he has thought about this before. The dual meaning of food as both a physical and emotional nutrient stands out for me in this moment. Abe and Leora nurturing one another, like with so many couples, is a deep and continual challenge. Theresa, seventy, fifty pounds overweight, the subject of Friendly Fire,https://shirahvollmermd.wordpress.com/2010/01/23/friendly-fire/, seeing me consistently for ten years, says “I don’t know why I resisted weight watchers for all these years. I am doing it now and it is the best part of my life.” “No kidding,” I reply, thinking over the numerous discussions we had about how she can help herself with her weight problem. “I go there,” she continues enthusiastically, “and I feel like I have a loving family.” Fellowship, I think, is the strength of these meetings. Blue, fifty-three, a patient of mine for three years, seventy pounds overweight, refuses to go to weight watchers, saying “I know what to do, I just don’t do it.” “Yes,” I respond, ” but Weight Watchers can help keep you focused.” “Well, I don’t think so,” she responds, as if we are in an argument. Persuasion, the art of it, is not often my job, but sometimes I think about how people can help themselves if they become more open to new experiences. Pre-conceived notions, resistances, get in the way, and sometimes these resistances are more rigid; other times there is an opening. I recognize with Blue that the feeling of being in a fight signals that the resistances are strong in this moment. I wonder if Blue will be like Theresa, wondering ten years from now, why she did not go sooner. Like antidepressant medication does not help every depressed person, Weight Watchers is not helpful for everyone with a weight problem. 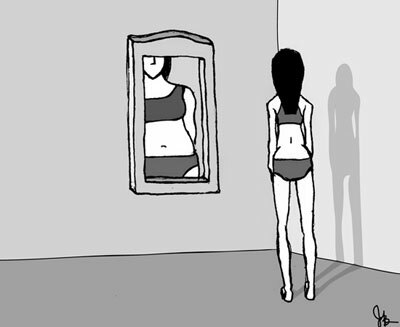 Yet, everyone with a weight problem could go once to see how it feels; to see if they think it is worth their time and money. Having said that, I am mindful of the emotional risk of trying to lose weight; fearing that a failed attempt will just make things worse psychologically speaking. Like a child who does not study for a test so that he does not feel bad if he does not do well, many people with weight problems prefer to avoid their food issues, rather than chance feeling like a failure. Appetite suppressanst and/or liposuction can be attractive because with these interventions, it is the procedure that failed, not the person. Weight is so interesting to me-the obvious mind/body connection. The meaning of food, the meaning of eating, is so rich with conscious and unconscious experiences. Food is an personal experience, a family experience and a social experience. The value we place on eating, the types of foods, the portions of food are all driven by biology, culture and emotional states. How these three factors are woven together define our relationship to our body and to our mind. Theresa knew that she would feel better if she lost weight. She also felt lonely and food gave her comfort. Simplistically speaking, now that she has found comfort with her new “family” she has less of a need to comfort herself with large portions of food. I say simplistically speaking because on the one hand I know it might be more complicated than that, but on the other hand, I wonder if it is as simple as that. In other words, Theresa needed a “family” to motivate her to take better care of herself. For reasons that are not clear to me, she joined Weight Watchers at a time in her mental life where she was open to having a new “family”. By contrast, Blue is in a scared place, a closed mental space, such that she is not emotionally ready to try new ways to tackle her weight problem. How much I wait for her to open up in her own time, and how much I push her to reconsider her decisions is the art of my job. Seeing Theresa’s turn with her eating, along with a turn in her mental state, makes me want to push Blue a little harder. At the same time, maybe I should let Blue change the subject; maybe I should respect her resistance. Dilemma. This blog is part of my series on the Neurobiology of Behavior. With Thanksgiving here, I am interested in the work of Linda Bartoshuk PhD, a Presidential Endowed Professor of Community Dentistry and Behavioral Science at the University of Florida. Her research, spanning three decades, has focused on the genetic variations in the perception of taste. Through studies of the disposition and the density of taste buds on the tongues of test subjects, Bartoshuk has divided people into three categories: supertasters, tasters and non-tasters. Supertasters, despite their name, are oversensitive to flavor and so prefer bland foods. Tasters are people who can develop a sophisticated palate, some of whom will become food critics. Non-tasters do not appear to care too much about food. Bartoshuk’s work makes me wonder if people can be divided into three categories of feeling sensitivity. There is the supersensitive, those who are so vulnerable to feeling that they cope in the world by being emotionally flat. There are the sensitive types, who like food critics, can parse out different kinds of feelings in any given situation. Finally, there are the non-feeling types, who although they have feelings, they only feel feelings which are hammered in. They miss the subtlety. Adding on, I wonder if matching sensitivity types could help one predict the longevity of a marriage. The non-feeler would do well with the sensitive type, since they could help each other manage feelings to enhance their lives, but at the same time, they could manage their feelings so that they do not get overwhelmed. Sensitive types would do well marrying each other also, but they would not do well with the supersensitive type who needs to maintain equanimity by denying his feeling state. Looking at feeling states, as we look at taste, we could imagine that we come into this world with certain sensitivities and certain insensitivities. Understanding those innate sensitivities and insensitivities could help us make good decisions for ourselves and our loved ones. Many people learn about themselves intuitively, or from their family and friends. However, there are times when a person can no longer help themselves, and their family and friends are at a loss as well. At those times, the individual can reach out to a therapist, gain insight into their wiring and thereby reclaim their lives.